Launch day is a cause for celebration, especially for yacht owners. So, when owners choose “Utopia” as part of their yacht’s name, you know their feelings are all the more passionate. 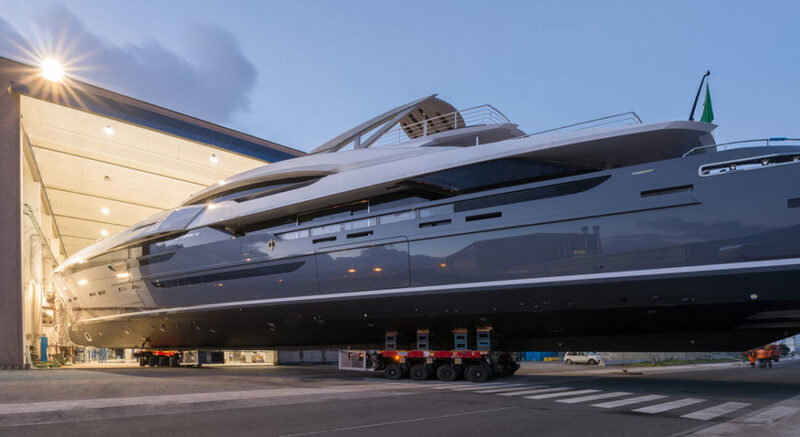 The morning of March 10 saw a multitude of emotions at Rossinavi as Utopia IV slipped into the water for the first time. The Ridingers commissioned the 207-foot (63-meter) Utopia IV to replace a 150-footer they’d owned for a number of years. At the launch, JR Ridinger commented on how impressed he was with the Rossi family, owners of the Rossinavi shipyard. Specifically, he appreciated how they understand engineering and construction. He further appreciated how he could have such a large yacht with a relatively shallow draft and sporty performance. Uncommon for her LOA, Utopia IV draws just 7’2” (2.2 meters), plus reportedly can top out at 33 knots with quadruple MTU engines and waterjets. Team for Design – Enrico Gobbi tailored the styling and interior design around the Riddingers’ ideas. Her sleek lines hint at her speed. Her interior, meanwhile, has a comfortable, contemporary air. Utopia IV is as much for private cruising for 12 as she is for parties with business associates. The 36-foot (11-meter) beam should make guests feel there’s plenty of room to move about. A bar aft on the main deck stands ready to serve, while a handful of lounges cater to conversation. Further of note, Utopia IV has three pools, and a nearly 754-square-foot (70-square-meter) beach club. Look for her to debut at the fall boat shows.